The Polar Satellite Launch Vehicle (PSLV) is an expendable medium-lift launch vehicle designed and operated by the Indian Space Research Organisation (ISRO). It was developed to allow India to launch its Indian Remote Sensing (IRS) satellites into sun-synchronous orbits, a service that was, until the advent of the PSLV in 1993, commercially available only from Russia. PSLV can also launch small size satellites into Geostationary Transfer Orbit (GTO). PSLV has gained credence as a small satellite launcher due its numerous multi-satellite deployment campaigns with auxiliary payloads usually ride sharing along an Indian primary payload. Most notable among these was the launch of PSLV C37 on 15 February 2017 successfully deploying 104 satellites in sun-synchronous orbit, tripling the previous record held by Russia for most number of satellites sent to space on a single launch. Payloads can be integrated in tandem configuration employing a Dual Launch Adapter. Smaller payloads are also placed on equipment deck and customized payload adapters. Studies to develop a vehicle capable of delivering 600 kg payload to 550 km Sun-synchronous orbit from SHAR began in 1978. Among 35 proposed configurations, four were picked and by November 1980, a vehicle configuration with two strap-ons on a core booster (S80) with 80 tonne solid propellant loading each, a liquid stage with 30 tonne propellant load (L30) and an upper stage called Perigee-Apogee System (PAS) was being considered. By 1981, confidence grew in remote sensing spacecraft development with launch of Bhaskara-1 and the PSLV project objectives were upgraded to have vehicle deliver 1000 kg payload in 900 km SSO. As technology transfer of Viking rocket engine firmed up, a new lighter configuration shifting away from relying on three large solid boosters was proposed by team led by APJ Abdul Kalam and eventually selected. Funding was approved in July 1982 for finalized design employing a single large S125 solid core as first stage with six 9 tonne strap-ons (S9) derived from SLV-3 first stage, liquid fueled second stage (L33) and two solid upper stages S7 and S2. This configuration needed further improvement to meet the orbital injection accuracy requirements of IRS satellites and hence solid terminal stage (S2) was replaced with a pressure fed liquid fueled stage (L1.8 or LUS) powered by twin engines derived from roll control engines of first stage. Apart from increasing precision, liquid upper stage also absorbed any deviation in performance of solid third stage. Final configuration of PSLV D1 to fly in 1993 was (6 × S9 + S125) + L37.5 + S7 + L2. The inertial navigation systems are developed by ISRO Inertial Systems Unit (IISU) at Thiruvananthapuram. The liquid propulsion stages for the second and fourth stages of PSLV as well as the Reaction control systems (RCS) are developed by the Liquid Propulsion Systems Centre (LPSC) at Mahendragiri near Tirunelveli, Tamil Nadu. The solid propellant motors are processed at Satish Dhawan Space Centre (SHAR) at Sriharikota, Andhra Pradesh which also carries out launch operations. PSLV continues to support Indian and foreign satellite launches especially for low Earth orbit (LEO) satellites. It has undergone several improvements with each subsequent version, especially those involving thrust, efficiency as well as weight. In November 2013, it was used to launch the Mars Orbiter Mission, India's first interplanetary probe. ISRO is planning to privatise the operations of PSLV and will work through a joint venture with private industries. The integration and launch will be managed an industrial consortium through Antrix Corporation. In June 2018, the Union Cabinet approved ₹6,131 crore (US$850 million) for 30 operational flights of the PSLV scheduled to take place between 2019 and 2024. The PSLV has four stages using solid and liquid propulsion systems alternately. The first stage, one of the largest solid rocket boosters in the world, carries 138 t (304,000 lb) tonnes of hydroxyl-terminated polybutadiene-bound (HTPB) propellant and develops a maximum thrust of about 4,800 kilonewtons (1,100,000 lbf). The 2.8 m (9 ft 2 in) diameter motor case is made of maraging steel and has an empty mass of 30,200 kilograms (66,600 lb). Pitch and yaw control during first stage flight is provided by the Secondary Injection Thrust Vector Control System (SITVC), which injects an aqueous solution of strontium perchlorate into the nozzle to produce asymmetric thrust. The solution is stored in two cylindrical aluminium tanks strapped to the solid rocket motor and pressurised with nitrogen. Roll control is provided by two small liquid engines on opposite sides of the stage, the Roll Control Thrusters (RCT). On the PSLV and PSLV-XL, first stage thrust is augmented by six strap-on solid boosters. Four boosters are ground-lit and the remaining two ignite 25 seconds after launch. The solid boosters carry 9 t (20,000 lb) or 12 t (26,000 lb) (for PSLV-XL configuration) propellant and produce 510 kN (110,000 lbf) and 719 kN (162,000 lbf) thrust respectively. Two strap-on boosters are equipped with SITVC for additional attitude control. The PSLV-CA uses no strap-on boosters. The second stage employs the Vikas engine and carries 41.5 t (91,000 lb) of liquid propellant – unsymmetrical dimethylhydrazine (UDMH) as fuel and nitrogen tetroxide (N2O4) as oxidiser. It generates a maximum thrust of 800 kN (180,000 lbf). The engine is hydraulically gimbaled (±4°) to provide pitch and yaw control, while roll control is provided by two hot gas reaction control motors. The third stage uses 7 t (15,000 lb) of hydroxyl-terminated polybutadiene-based solid propellant and produces a maximum thrust of 240 kN (54,000 lbf). It has a Kevlar-polyamide fibre case and a submerged nozzle equipped with a flex-bearing-seal gimbaled nozzle (±2°) thrust vector engine for pitch & yaw control. Roll control is provided by the fourth stage reaction control system (RCS). The fourth stage is powered by regeneratively cooled twin engines, burning monomethylhydrazine (MMH) and mixed oxides of nitrogen (MON). Each engine generates 7.4 kN (1,700 lbf) thrust and is gimbaled (±3°) to provide pitch, yaw & roll control during powered flight. Coast phase attitude control is provided by RCS. The stage carries up to 2,500 kg (5,500 lb) of propellant in the PSLV and PSLV-XL and 2,100 kg (4,600 lb) in the PSLV-CA. ISRO has envisaged a number of variants of PSLV to cater to different mission requirements. There are currently two operational versions of the PSLV — the core-alone (PSLV-CA) without any strap-on motors, and the (PSLV-XL) version, with six extended length (XL) strap-on motors carrying 12 tonnes of HTPB based propellant each. These configurations provide wide variations in payload capabilities up to 3,800 kg (8,400 lb) in LEO and 1,800 kg (4,000 lb) in sun-synchronous orbit. The standard or 'Generic' version of the PSLV, PSLV-G had four stages using solid and liquid propulsion systems alternately and six strap-on motors (PSOM or S9) with 9 tonne propellant loading. It had capability to launch 1,678 kg (3,699 lb) to 622 km (386 mi) into sun-synchronous orbit. PSLV-C35 was last operational launch of PSLV-G before its discontinuation. The PSLV-CA, CA meaning "Core Alone", model premiered on 23 April 2007. The CA model does not include the six strap-on boosters used by the PSLV standard variant but two SITVC tanks with Roll Control Thruster modules are still attached to the side of the first stage with addition of two cylindrical aerodynamic stabilizers. The fourth stage of the CA variant has 400 kg (880 lb) less propellant when compared to its standard version. It currently has capability to launch 1,100 kg (2,400 lb) to 622 km (386 mi) Sun synchronous orbit. PSLV-XL is the upgraded version of Polar Satellite Launch Vehicle in its standard configuration boosted by more powerful, stretched strap-on boosters with 12 tonne propellant load. Weighing 320 t (710,000 lb) at lift-off, the vehicle uses larger strap-on motors (PSOM-XL or S12) to achieve higher payload capability. On 29 December 2005, ISRO successfully tested the improved version of strap-on booster for the PSLV. The first use of PSLV-XL was the launch of Chandrayaan-1 by PSLV C11. The payload capability for this variant is 1,800 kg (4,000 lb) to SSO. PSLV-DL variant has only two strapons boosters with 12 tonne propellant load on them. PSLV-C44 on 24 January 2019 was the first flight to use PSLV-DL variant of Polar Satellite Launch Vehicle. PSLV-QL variant has four ground-lit strap-on boosters with a combined propellant load of 48 tonnes. PSLV-C45 on 1 April 2019 was the first flight of PSLV-QL. PSLV-3S was conceived as a three-staged version of PSLV with its six strap-on boosters and second liquid stage removed. The total lift-off mass of PSLV-3S was expected to be 175 tonnes with capacity to place 500 kg in 550 km low Earth orbit. As of April 2019[update] the PSLV has made 47 launches, with 44 successfully reaching their planned orbits, two outright failures and one partial failure, yielding a success rate of 94% (or 96% including the partial failure). All launches have occurred from the Satish Dhawan Space Centre, known before 2002 as the Sriharikota Range (SHAR). ^ "SURPLUS MISSILE MOTORS: Sale Price Drives Potential Effects on DOD and Commercial Launch Providers". GAO.gov. U.S. Government Accountability Office. 16 August 2017. Retrieved 2 May 2018. ^ a b c d e f g h i "Polar Satellite Launch Vehicle". Retrieved 21 December 2014. ^ "Access to Space" (PDF). 2011. Retrieved 8 March 2017. ^ "ISRO at India Mobile Congress 2017". Retrieved 29 September 2017. ^ a b c d e f g h i j k l m n o "PSLV-C37 Brochure". ISRO. ^ a b c d e f g "PSLV_C41_Brochure" (PDF). Archived from the original (PDF) on 9 April 2018. Retrieved 9 April 2018. ^ a b c d e "PSLV Launch Vehicle Information". Spaceflight 101. Retrieved 20 February 2015. ^ "Welcome To ISRO :: Launch Vehicles". Retrieved 8 April 2014. ^ Barry, Ellen (15 February 2017). "India Launches 104 Satellites From a Single Rocket, Ramping Up Space Race". The New York Times. ISSN 0362-4331. Retrieved 15 February 2017. ^ "ISRO's record satellites' launch: 10 top facts - Times of India". The Times of India. Retrieved 15 February 2017. 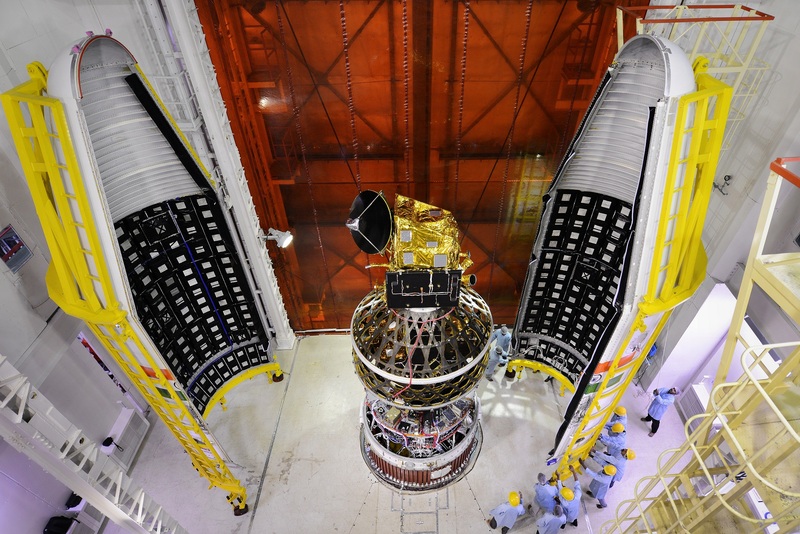 ^ "PSLV C35 / Scatsat-1 with Dual Launch Adapter". Retrieved 19 December 2017. ^ Cong, Indian Science (5 January 2016). "Here's the #103ISC Official Newsletter 2nd edition brought by Journalism students and researchers. 2/2 @PIB_Indiapic.twitter.com/mLq9CZnY5T". @103ISC. Retrieved 19 December 2017. ^ "The DMC3 Constellation launch in photos". Retrieved 19 December 2017. ^ "Indian ambitions in space go sky-high". New Scientist. 22 January 1981. p. 215. ^ a b Rao, P.V. Monoranjan; Radhakrishnan, Paramaswaran (2012). A brief history of rocketry in ISRO. Orient Blackswan. p. 215. ISBN 978-8173717642. ^ a b Rao, P.V. Manoranjan, ed. (2015). "2.6 PSLV: The workhorse of ISRO by N. Narayanamoorthy". From fishing hamlet to red planet. Harpercollins. ISBN 978-9351776895. ^ Raj, Gopal (2000). "8. PSLV: Achieving Operational Launch Capability". Reach For the Stars: The Evolution of India's Rocket Programme. Viking. ISBN 978-0670899500. About a year later, an important change was made, with the solid fourth stage being substituted by a liquid stage. This change was considered necessary since the accuracy with which the IRS satellites had to be put into orbit — within 15 km in terms of orbital height and within 0.1 degree of the desired orbital inclination — could not be achieved with a solid stage. ^ "APJ Abdul Kalam's contribution in making India a member of space club". News18. Retrieved 14 October 2018. ^ Abdul, Kalam A. P. J. (2010). Ignited Minds: Unleashing The Power Within India. Pearson Education India. p. 34. ISBN 978-81-317-2960-1. ^ "India (Launchers)". Spacecraft Encyclopedia. Retrieved 12 November 2014. ^ "PSLV (1)". Gunter's Space Page. Retrieved 12 November 2014. ^ "PSLV". Gunter's Space Page. Retrieved 12 November 2014. ^ "Welcome To ISRO :: Mars Orbiter Mission". Retrieved 8 April 2014. ^ "ISRO looks at JV for PSLV manufacture; launch to be privatized by 2020". Geospatial World. 26 October 2017. Retrieved 26 October 2017. ^ "ASACO sub-systems for space". Archived from the original on 16 October 2018. Retrieved 16 October 2018. ^ a b c d "PSLV Datasheet". ^ Subramanian, T.S. (15 July 2011). "The PSLV is a proud symbol of ISRO's self-reliance". The Hindu. Chennai, India. ^ "Outcome Budget 2016-2017" (PDF). Government of India, Department of Space. 2016. Retrieved 15 September 2018. Currently, two versions of PSLV are operational, namely PSLV-XL (with six extended version of Strap-on motors) and the PSLV Core-alone (without Strap-on motors). ^ a b "2.6 PSLV: The Workhorse of ISRO by N. Narayanamoorthy". From Fishing Hamlet to Red Planet: India's Space Journey. Harpercollins. 2015. ISBN 978-9351776895. ^ a b c "India's PSLV" (PDF). www.earth2orbit.com. 15 March 2009. Archived from the original (PDF) on 10 July 2011. ^ "New Solid Propellant Motor to Increase PSLV Capability". ISRO. Archived from the original on 17 February 2009. ^ Rajwi, Tiki. "SLV-C44 to lift-off with added features". Retrieved 11 January 2019. ^ Rajwi, Tiki (12 January 2019). "PSLV lift-off with added features". The Hindu. ISSN 0971-751X. Retrieved 12 January 2019. ^ "Launch Kit C45". ISRO. Retrieved 23 March 2019. ^ "Evolution of Indian launch vehicle technologies" (PDF). www.ias.ac.in. Indian Academy of Sciences. 25 December 2007. Archived from the original (PDF) on 24 May 2011. ^ "Future of Space Transportation: S. Somanath" (PDF). 9 February 2016. ^ Murthi, K.R. Sridhara (9 May 2009). "Space Debris Mitigation - Coordination and Implementation efforts in India" (PDF). Retrieved 22 November 2017. ^ "ISRO's baby rocket to carry small satellites, likely to take off in 2019". The New Indian Express. Retrieved 2 January 2018. ^ "PSLV- The Travel Beyond the Blue! #ISRO #VikatanInfographic". www.vikatan.com (in Tamil). Retrieved 20 February 2017. ^ "Polar Satellite Launch Vehicle". Retrieved 29 November 2018. Wikimedia Commons has media related to Polar Satellite Launch Vehicle.